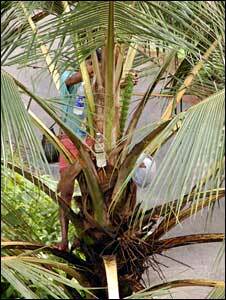 People in the southern state of Kerala are the heaviest drinkers in India, and sales of alcohol are rising fast. The BBC's Soutik Biswas examines why. Jacob Varghese says he began drinking when he was nine years old, sipping on his father's unfinished whisky and brandy in glass tumblers. It's a terrifying story of a descent into alcoholism for this 40-year-old health inspector. At school, he consumed cheap local liquor. He lived in a haze of alcohol through his teens and dropped out of college. He lost a job, cut his wrists twice trying to end his life, landed up in rehabilitation centres and at the age of 32, was reduced to begging on the streets to fund his alcohol habit. 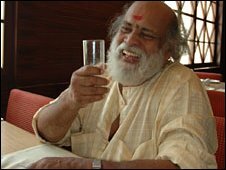 "Drinking is a disease in Kerala," he says, his voice dropping to a whisper. "I lost my kin, my respect and all my money chasing alcohol. Everyone encourages you to have it - your friends, the government." This was before he was dragged to the local Alcoholics Anonymous chapter by friends. This, after 17 years of drinking had reduced him to a mental wreck and a pauper. Mr Varghese has been sober for the past eight years, and is now married with children and holds down a job. "Many of my friends have not been as lucky. So many of my drinking buddies died, and others landed up in mental asylums," he says. Kerala is India's tippler country. It has the highest per capita consumption - over eight litres (1.76 gallons) per person a year - in the nation, overtaking traditionally hard-drinking states like Punjab and Haryana. Also, in a strange twist of taste, rum and brandy are the preferred drink in Kerala in a country where whisky outsells every other liquor. Alcohol helps in giving Kerala's economy a good high - shockingly, more than 40% of revenues for its annual budget come from booze. A state-run monopoly sells alcohol. The curiously-named Kerala State Beverages Corporation (KSBC) runs 337 liquor shops, open seven days a week. Each shop caters on average to an astonishing 80,000 clients. This fiscal year the KSBC is expected to sell $1bn (£0.6bn) of alcohol in a state of 30 million people, up from $12m when it took over the retail business in 1984. Similarly, revenues from alcohol to the state's exchequer have registered a whopping 100% rise over the past four years. The monopoly is so professionally run that consumers can even send text messages from their phones to a helpline number to record their grievances. "If we delay opening any of our shops by even five minutes, clients send us text messages saying that they are waiting to buy liquor," says KSBC chief N Shankar Reddy. That's not all. There are some 600 privately run bars in the state and more than 5,000 shops selling toddy (palm wine), the local brew. There is also a thriving black market liquor trade. Despite a growing number of people who demand a ban on the sale and consumption of alcohol, there is an equally spirited group of hard-core drinkers who lobby for cheaper and more widely distributed liquor. One of them is well-known actor NL Balakrishnan, a veteran of more than 200 films, who launched a lobby group called Forum for Better Spirit in 1983. The forum's manifesto asks the government to provide liquor through the state-subsided public distribution system, boost toddy production, slash prices for elderly drinkers and supply free alcohol to drinkers over 90. The jolly and convivial Mr Balakrishnan, 67, says his father "initiated" him into drinking when he was four. "We used to go to the cinema together. After the show was over, he would take me to a toddy shop where he would drink. He would give me a few spoons of toddy too. It was an amazing experience," he says. He says when his father died at the ripe age of 98 after a "lifetime of heavy drinking", he wet his lips with liquor and not holy water, as is the Hindu custom. Mr Balakrishnan says that on his average day out with his drinking buddies he downs 22 shots of his favourite brandy - and "never has any problems". "If you have willpower and have enough food to go with your drink, booze will never harm you," he says cheerily. But drinking is killing a lot of people and exacting a heavy social cost, say doctors and activists. Rising numbers of divorces in Kerala are linked to alcohol abuse. Johnson J Edayaranmula, who runs the Alcohol and Drug Information Centre, a leading NGO, puts the figure as high as 80%. And the majority of road deaths in the state - nearly 4,000 during 2008-2009 - are due to drink driving, he says. Hospitals and rehab centres are packed with patients suffering from alcohol-related diseases. The situation is so grim that, ironically, the KSBC itself is planning to open a hospital specialising in treating alcohol-related problems. It also runs a campaign to combat alcohol abuse. But why do people in Kerala drink so heavily? Jacob Varghese says it is a "societal problem" - what he possibly means is that drinking liquor is almost a social rite of passage, taken very seriously. But he elaborates other, perhaps more important, reasons - high unemployment, easy access to alcohol and the fact that drinking has become a "part of upwardly mobile living". Most activists believe that "prohibition" is not the solution - it just drives buyers and sellers underground. "The solution possibly lies in introducing drinks with mild alcohol content. And since drinking is also a cultural problem, people need to be made aware of the havoc that alcohol can wreak on their lives," says Mr Edayaranmula. 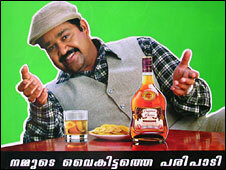 Until then alcohol will continue to dominate the lives of many of Kerala's people - and boost its exchequer's finances.